Old Testament - Today in Leviticus chapter 9 we read about Aaron & his sons beginning their priestly ministry. I liked verse 24 as a closing verse to this chapter - "Fire blazed forth from the LORD's presence and consumed the burnt offering and the fat on the altar. When the people saw all this, they shouted with joy and fell face down on the ground." I think what this verse does for me is to really confirm that all of the Offerings we are reading about in Leviticus were ordained by God at that time and that what we are reading about in Leviticus is truly part of God's story. Not that I ever doubted this fact - but, when you read about God consuming the offering in fire in such a dramatic fashion, you realize that God was fully pleased with the priest's and the people's obedience. The Offerings are part of God's story - and are foreshadowing the final Offering of Jesus on the cross. Do you believe the Offerings are a part of our spiritual history? 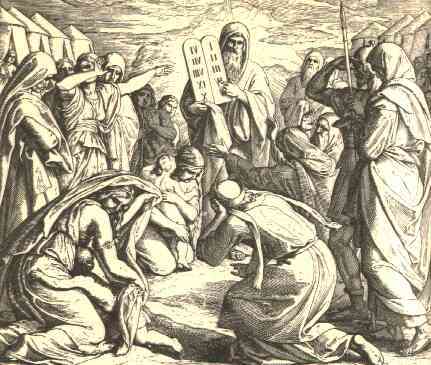 In Leviticus chapter 10 we read about the disobedience of Nadab and Abihu. You'll recall 2 days ago that we read in Leviticus Chapter 6 verse 13 - "Remember, the fire must be kept burning on the altar at all times. It must never go out." Commentaries state that the fire was never to go out because the fire was started by God. Humans were not to bring man-made fire to the altar, or they would die. I realize that this can seem like a very harsh punishment for disobedience.... it may help to remember that we saw disobedience from others earlier in the Bible - and we'll see disobedience again later in the Bible - without the consequence of immediate death. But, in this case, disobedience brought death. Think about the risk of disobedience in our lives today. Yeah, sure, maybe we can get away with something dangerous 9 times out of 10 - but, there is always the risk that the 10th time could prove lethal. So - why take the risk of disobedience at all? Is it worth it? Hmmm.... I think my little tangent on farming and being patient during the process above might play in well to Jesus' next parable of the mustard seed in verses 30 through 32 - "Jesus asked, "How can I describe the Kingdom of God? What story should I use to illustrate it? It is like a tiny mustard seed. Though this is one of the smallest of seeds, it grows to become one of the largest of plants, with long branches where birds can come and find shelter."" I think if we can have faith in the seed that Jesus plants in our hearts - be it the Gospel, the Bible, healing - we will see an amazing plant grow that will ultimately bless others. From the tiniest beginnings, with patience and faith, can come the largest of plants. Will you let Jesus plant a needed mustard seed in your heart? And will you be patient and allow the seed time & space to grow? Commentary from Bible.org on Mark chapter 4 is at this link, and at this link. Psalms - Psalm 37 verses 30 & 31 continue to read like amazing Proverbs - "The godly offer good counsel; they know what is right from wrong. They fill their hearts with God's law, so they will never slip from his path." Are you filling your heart with God's teachings? Are you doing this so that you will never slip from his path? Are you offering good counsel to those around you? When others around you see you, do they see someone that clearly knows what is right from wrong? Proverbs 10 verse 7 is so simple but so true... "We all have happy memories of the godly, but the name of a wicked person rots away." Today in Leviticus chapter 8 we read about the Ordination of the Priests. Many of you will recall that we read something very similar to this chapter earlier this year in Exodus chapter 29 - click on this link to review. 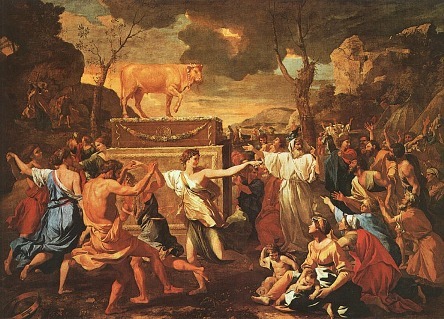 An image for verse 14 - "Then Moses brought in the bull for the sin offering, and Aaron and his sons laid their hands on its head..."
Great commentary on bible.org about Priesthood in the Old Testament is at this link. New Testament - Mark chapter 3 verses 33-35 make an impact on me each time I read this - "Jesus replied, "Who is my mother? Who are my brothers?" Then he looked at those around him and said, "These are my mother and brothers. Anyone who does God's will is my brother and sister and mother." This last sentence is a powerful proclamation from Jesus. If we are obedient to God's will in our life we are brothers and sisters and mothers of Jesus. Pretty cool to think about! Jesus is not only our savior - but our brother. And later he calls us friends. Matthew Henry's Concise Commentary puts it this way - "It is a great comfort to all true Christians, that they are dearer to Christ than mother, brother, or sister as such, merely as relations in the flesh would have been, even had they been holy. Blessed be God, this great and gracious privilege is ours even now; for though Christ's bodily presence cannot be enjoyed by us, his spiritual presence is not denied us." 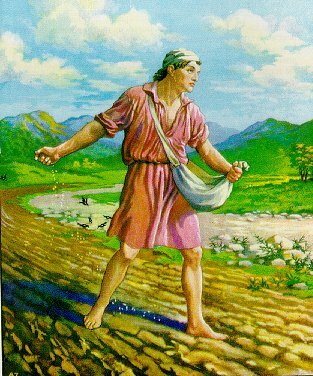 Mark chapter 4's parable of the Farmer scattering seed is a parable that I am sure can convict each of us in various ways. Verses 16 through 18 I am afraid can sometimes represent all too well the "soil" of my heart... "The rocky soil represents those who hear the message and receive it with joy. But like young plants in such soil, their roots don't go very deep. At first they get along fine, but they wilt as soon as they have problems or are persecuted because they believe the word. The thorny ground represents those who hear and accept the Good News, but all too quickly the message is crowded out by the cares of this life, the lure of wealth, and the desire for nice things, so no crop is produced." The crowding out of the Good News by the cares of this life and the desire for nice things is where I am afraid I miss the mark too often. And when I succumb to theses cares & desires, indeed, no crop is produced. However - I do think there are moments in my life where I can see the amazing power & truth in verse 20 - "But the good soil represents those who hear and accept God's message and produce a huge harvest--thirty, sixty, or even a hundred times as much as had been planted." I just pray for more consistency in my life to live in verse 20 than in the previous verses... How about you? How is the soil of your heart? Which verses in this parable are you living in these days? Are you receiving God's Word into your heart? Will you allowing God's Word in your heart to produce a huge harvest? Verses 24 and 25 are such powerful truths for us to realize as we make this journey through life with Jesus, God and the Holy Spirit - "And be sure to pay attention to what you hear. The more you do this, the more you will understand--and even more, besides. To those who are open to my teaching, more understanding will be given." What I love about this is that it is so true - the more we learn.... the more we will then continue to learn! If we remain open to Jesus' teaching all of our lives - and remain humble in realizing that we never truly have it all figured out - we will continue to be given more and more and more understanding from Jesus. I heard a sermon just tonight where the teacher said "there are no plateau's in our spiritual journey!" That was profound for me to hear. I do think there are times when I think I can just rest on my laurels or past accomplishments... but Jesus calls us in these verses to continue learning from his teaching's all of our lives. I believe studying God's Word consistently is one powerful way we can do exactly this. I pray you are well on your way of this life long journey of studying God's Word. Psalms - Psalm 37 verse 16 is so powerful - "It is better to be godly and have little than to be evil and possess much." I don't know what I can add to this.... I think you probably get it. :) Do you live it? Verse 23 is so amazing... "The steps of the godly are directed by the LORD. He delights in every detail of their lives." I don't mean to infer that I am godly here by any means.... but, I will admit that there are times in my life where I really sense that God is directing my steps - and taking care of every detail. And basically, it feels like I am sort of just going with God's flow. Things are just happening beautifully. And I do sense the Spirit often during these times. I guess my one sadness is that I don't realize that God is directing my steps all of the time. And that he is delighting in every detail of my life - most of the time... :) I pray I will come to a greater awareness of this in my life each and every moment - "The steps of the godly are directed by the LORD. He delights in every detail of their lives." Proverbs chapter 10 verse 5 - "A wise youth works hard all summer; a youth who sleeps away the hour of opportunity brings shame" - for some reason reminds me of Paul's writings in 2 Corinthians chapter 6 verse 2 - "Behold, now is the favorable time; behold, now is the day of salvation." Is the hour of opportunity upon you now? Will you stay awake for it? Is now the favorable time? Is now the day of salvation? Can you relate to this image above? Can you imagine what this man in this image above is experiencing? Have you experienced this? A cool overview of the Holy Spirit is at bible.org at this link. 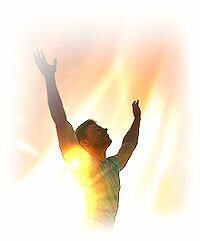 A great overview of the Holy Spirit in the Old Testament is at this link. And a great overview of the Holy Spirit in the New Testament is at this link. I don't know if you've ever done much study on the Holy Spirit? If not, please do spend a good chunk of time at these 3 links above. Also, I remember a good friend of mine was reading a book a few years ago called "Holy Spirit" - I believe... He said it was an incredible book. I haven't read it. Has anyone else read it? Know the author's name? Or - do you have any other Holy Spirit book or other resources recommendations? If so, can you post up in the Comments section below? Thanks. Leviticus chapter 7 verse 27 stands out - "Anyone who eats blood must be cut off from the community." This was commanded for 3 reasons - 1. to separate the Israelites from the pagans who drank blood - the pagans drank blood in the hopes of gaining the attributes of the animals from the blood they drank (speed, strength, etc.). 2. the sin of the people was symbolically transferred to the animal before the offering, and the blood represents the life of that animal. 3. for sanitary reasons - blood can carry some nasty diseases. New Testament - In Mark chapter 3 verses 7 & 8 show how Jesus' ministry was quickly being noticed from all over Israel - "Jesus and his disciples went out to the lake, followed by a huge crowd from all over Galilee, Judea, Jerusalem, Idumea, from east of the Jordan River, and even from as far away as Tyre and Sidon. The news about his miracles had spread far and wide, and vast numbers of people came to see him for themselves." And now today think about how far and wide Jesus' ministry has gone. Worldwide. Why do you suppose Jesus' ministry gained such notice during his lifetime? Why do you suppose that Jesus' ministry continues to gain such notice today? Could it be that there is true power in Jesus' ministry? Could it be that Jesus changes lives? Heals people - teaches people - loves people - forgives people.... Could it be that Jesus is the Savior of the World? Commentary from bible.org on Mark chapter 3 is at this link and at this link. Psalms - Psalm 37 is most definitely a Wisdom Psalm! It's like we are reading Proverbs today! :) I love verse 5 - "Commit everything you do to the LORD. Trust him, and he will help you." Do you commit everything you do to God? EVERYTHING? Your waking life? Your sleeping life? Your job? Your relationships? Your family? Your finances? Your time? If so, do you trust that God will help you in everything you do in your life? Do you believe what verse 4 teaches? - "Take delight in the LORD, and he will give you your heart's desires." I love that thought - take delight in God. Do you take delight in God each and every day? 1. Burnt Offering - Voluntary act of worship; atonement for unintentional sin in general; expression of devotion, commitment and surrender to God. Bull, ram or male bird is offered - wholly consumed no defect. 2. Grain Offering - Voluntary act of worship; recognition of God's goodness and provisions; devotion to God. Grain, fine flower, olive oil, incense, baked bread, salt offered - accompanied burnt and fellowship offering. 3. Fellowship Offering - Voluntary act of worship; thanksgiving and fellowship as it included a communal meal. Any animal without defect from herd or flock offered. 4. Sin Offering - Mandatory atonement for specific unintentional sin; confession of sin; forgiveness of sin; cleansing from defilement. Young bull for high priest & congregation offered. Male goat for leader. Female goat or lamb for common person. Dove or pigeon for the poor. Tenth of an ephah of fine flower for the very poor. 5. Guilt Offering - Mandatory atonement for unintentional sin requiring restitution; cleansing from defilement; make restitution; pay 20% fine. Ram or lamb offered. Chapter 4 verse 29 contains something new I learned today again from Zondervan - "They are to lay a hand on the head of the sin offering and slaughter it at the place where burnt offerings are slaughtered." The sin offering included confession (see chapter 5 verse 5) and the symbolic transfer of guilt by laying hands on the sacrifice, as we see here in verse 29. This is the first time I've understood that the laying on of hands on the offering symbolically transferred guilt to the offering. Chapter 4 verse 21 foreshadows Jesus' death on the cross outside the gates of Jersusalem at Golgotha - "The priest must then take what is left of the bull outside the camp and burn it there, just as is done with the sin offering for the high priest." Here's how Hebrews chapter 13 verses 11 through 14 looks back at this verse in Leviticus - "The high priest carries the blood of animals into the Most Holy Place as a sin offering, but the bodies are burned outside the camp. And so Jesus also suffered outside the city gate to make the people holy through his own blood. Let us, then, go to him outside the camp, bearing the disgrace he bore. For here we do not have an enduring city, but we are looking for the city that is to come." Commentary on Leviticus chapter 4 and the Sin Offering is at this link. Commentary on Leviticus chapter 5 and the Guilt Offering is at this link. Jesus' teaching in Mark chapter 2 verse 27 is very wise for each of us to keep in mind - particularly in light of all of our recent conversations on this blog about the Sabbath :) - ""The Sabbath was made to benefit people, and not people to benefit the Sabbath." Commentary on Mark chapter 2 is online at bible.org at this link. Psalms - I love Psalm 36 today! There are some powerful verses in this Psalm... Starting off with verse 1 being a scary & true verse... "Sin whispers to the wicked, deep within their hearts. They have no fear of God to restrain them." Wow. I'll admit - I've been there. I know what it is like to have sin whispering deep within my heart. Thank God for the gift of Jesus - the savior of my world... Thank God for the gift of the fear of God. And thank God for the gift of the Holy Spirit who directs us along the narrow path - the path of life and light. I pray that verse 1 does not ring too true for you today - but if it does, please pray to Jesus to instead fill your heart with Jesus' Spirit, who is the only power that can truly dispel the whisper of sin within. Verse 9 just has so much simplicity in it's truth... I love it... I hope you believe this too - "For you are the fountain of life, the light by which we see." Are there really any other fountains of life? Are there really any other lights by which we may see? Proverbs - We start Proverbs chapter 10 today and the Proverbs of Solomon, son of David. Verse 2 is another great reminder for each of us... "right living can save your life." Do you believe this? Do you practice this? We start the book of Leviticus today! And - before we begin - I beseech you to please read Bob Deffinbaugh from bible.org's fantastic reflections of the book of Leviticus at this link below, entitled "Learning to Love Leviticus." Each year in the One Year Bible I hear some "this is boring…" comments about Leviticus - so please please make sure you check out the link below. I do honestly believe that you can learn to love Leviticus this year! Content: The book of Leviticus was designed to be a handbook for the priests or Levites, hence the name Leviticus. It sets down the regulations that were to govern the life of Israel in general and specifically to give regulations concerning sacrifice and worship. All of the major sacrifices are described, as well as the way they were to be offered. All of the major festivals and holidays are discussed. There are also special sections devoted to the priesthood and regulations concerning ceremonial matters. Theme: The central theme of this book is that God has provided a way for atonement to be made by the offering of sacrificial blood. This whole system found its fulfillment in the shedding of Christ's blood as the one great sacrifice for the sins of the world. Leviticus also shows that worship is to be orderly and is to follow a regular pattern. Commentary on Leviticus chapter 1 and The Law of Burnt Offerings is at this link. Commentary on Leviticus chapter 2 and The Grain Offering is at this link. Commentary on Leviticus chapter 3 and The Fellowship Offering is at this link. 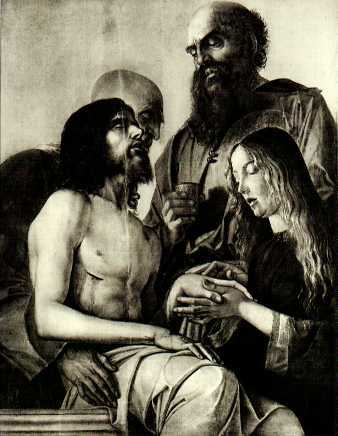 New Testament - Today in Mark's readings I noticed that Jesus healed, taught, healed and healed. 3 healings and 1 teaching in today's readings. I don't know about you, but sometimes I personally seem to overlook Jesus' healing ministry. I pay a lot of attention to what he did on the cross for us. I pay a lot of attention to his resurrection. I pay a lot of attention to his teachings. But his healings? Not so much.... And if I really stop to think about it, I know that I personally need some healing from Jesus in my life. I have wounds. I have issues. I have "patterns" as David Wilcox would say - (tangent - I just went to a David Wilcox concert tonight... amazing... his new tunes are incredible). I need Jesus' healing touch in my life. How about you? Do you need Jesus' healing touch in your life? If so, can you reflect on chapter 1 verses 40 & 41 in Mark's readings today - "A man with leprosy came and knelt in front of Jesus, begging to be healed. "If you want to, you can make me well again," he said. Moved with pity, Jesus touched him. "I want to," he said. "Be healed!"" What is your "leprosy"? Do you want to be made well again? Do you believe that Jesus wants to heal you? Commentary on Mark chapter 1 is at bible.org at this link. Proverbs verses today remind us that Folly calls out to us constantly.... just as Wisdom calls out to us. Whose call are you listening to today? Big reading day today! We wrap up Exodus and begin Mark! Old Testament - Today is the final day of readings from Exodus. I hope that your reading this past month about the Israelites Exodus from Egypt and their emergence as a nation under Moses' leadership has been a good learning experience for you? And more than anything - I hope that reading about God's interactions with his covenant people in Egypt, through the plagues, the Red Sea, the manna from heaven, the Ten Commandments, and the plans for the Tabernacle has expanded your understanding of who God is and God's story? If anyone wants to reflect back on what may have been an interesting learning for you in Exodus this year, please do post up in the Comments section below. Bible.org's commentary on Exodus chapter 40 is at this link. New Testament - Yesterday I didn't really get a chance to post up my closing reflections on the Gospel of Matthew this year. I think the main thing that really stood out to me in the Gospel of Matthew readings this year was how powerfully truthful and insightful Jesus' teachings are in the parables. Some of the parables really took on new life & meaning for me this year as I read through Matthew. It is such an amazing thing - every time I read the Bible - or re-read portions of the Bible I should say - I gain some new insight that I never saw before. I hope that has been the case for you as you read through Matthew this year? Please feel free to post up any closing reflections on your reading of the book of Matthew in the Comments below if you'd like. And today we begin the Gospel of Mark! Content: John Mark was a companion of the apostle Paul. He finally settled in Rome where he wrote down the remembrances of the apostle Peter. Thus Mark’s Gospel reflects the words of an eyewitness of the events he describes. Mark’s purpose was to put together an expanded Gospel message. Hence it centers upon the acts of Jesus rather than his words and devotes a disproportionately large amount of material to the last week of Jesus’ life. Mark’s Gospel begins with Jesus’ public ministry and preaching of the gospel of the Kingdom of God. Several explicit predictions of his coming death are made (Mark 8:31; 9:31; 10:33-34, 45) and then Jesus goes to the cross to die for the sins of the world. Theme: Mark depicts Jesus as the Servant of God who came to do God’s will. The miracles, healings, victory over demons, and personal power show the world that Jesus was no ordinary servant, but was truly the Son of God (Mark 15:39). Jesus’ resurrection authenticated all that he did, and now we await his return in glory from heaven. Mark also wrote to encourage the Roman Christians in a time of persecution. I know I mentioned this when we read through the Baptism narrative in Matthew, but I think this is so cool... that I gotta mention it again. All three persons of the Trinity are involved in Jesus' Baptism - 1. the Father speaks 2. the Son is Baptized 3. the Holy Spirit descends on the Son. Verses 10 & 11... "And when Jesus came up out of the water, he saw the heavens split open and the Holy Spirit descending like a dove on him. And a voice came from heaven saying, "You are my beloved Son, and I am fully pleased with you."" Per Tyndale's commentary today, Jesus was baptized 1. to begin his mission to bring the message of salvation to all people; 2. to show support for John's ministry; 3. to identify with our humanness and sin; 4. to give us an example to follow. Psalms - Per Zondervan's commentary Psalm 35 today is an appeal to the heavenly King, as divine Warrior and Judge, to come to the defense of his servant who is being maliciously slandered by those toward whom he had shown only the most tender friendship. I apologize that I am short on time today for a full post... Matthew 28 is one of the most important chapters of the Bible we will read this year. Jesus' resurrection is the key to the Christian faith. The resurrection is the fulfillment of Old Testament prophecy and of Jesus' own statements. Tyndale Publishers outlines these 5 points in their commentary today based on the writings of Paul in 1 Corinthians 15: The resurrection guarantees 1. that Jesus was truly the Son of God. 2. God the Father accepted what Jesus did at Calvary on the basis of the resurrection. 3. Jesus as our Risen Lord pleads for his people before the Father. 4. Believers have the hope of eternal life. 5. Believers will also rise and have resurrected bodies. The Great Commission at the end of Matthew chapter 28 in verses 18-20 is so important for us as followers of Jesus on Earth today - "Jesus came and told his disciples, "I have been given complete authority in heaven and on earth. Therefore, go and make disciples of all the nations, baptizing them in the name of the Father and the Son and the Holy Spirit. Teach these new disciples to obey all the commands I have given you. And be sure of this: I am with you always, even to the end of the age."" How are you participating in Jesus' Great Commission today in your life? Are you making disciples? Are you baptizing? Are you teaching people to obey Jesus' commands? Do you believe that Jesus is with you now - and forever? Old Testament - Exodus chapter 34 verses 6 & 7 are beautiful and we will hear these words repeated again later in the Old Testament a few times - ""I am the LORD, I am the LORD, the merciful and gracious God. I am slow to anger and rich in unfailing love and faithfulness. I show this unfailing love to many thousands by forgiving every kind of sin and rebellion." How do these words resonate with you? Do you believe God is merciful and gracious? Slow to anger? And rich in unfailing love and faithfulness? Have you asked God for forgiveness for your sins and rebellion? Verses 33 through 35 in today's readings - "When Moses had finished speaking with them, he put a veil over his face. But whenever he went into the Tent of Meeting to speak with the LORD, he removed the veil until he came out again. Then he would give the people whatever instructions the LORD had given him, and the people would see his face aglow. Afterward he would put the veil on again until he returned to speak with the LORD." Below is an image consideration for verses 29 & 30 - "When Moses came down the mountain carrying the stone tablets inscribed with the terms of the covenant, he wasn't aware that his face glowed because he had spoken to the LORD face to face. And when Aaron and the people of Israel saw the radiance of Moses' face, they were afraid to come near him." Bible.org's commentary on Exodus chapter 34 is at this link. Psalms - Psalm 33 verse 12 is awesome - "In him our hearts rejoice, for we are trusting in his holy name." Does your heart literally rejoice when you think about God? Do you trust in God's holy name? Proverbs chapter 9 verses 5 & 6 are a reminder that not only does Temptation call us (as we've read earlier in Proverbs this year), but Wisdom calls out to us as well! "Come, eat my food, and drink the wine I have mixed. Leave your foolish ways behind, and begin to live; learn how to be wise." Which voice are you listening to? Whose invitation are you accepting? Temptation's? Or Wisdom's? Old Testament - Today Exodus chapter 32 verse 1 made me think about spiritual "boredom" - "When Moses failed to come back down the mountain right away, the people went to Aaron. "Look," they said, "make us some gods who can lead us. This man Moses, who brought us here from Egypt, has disappeared. We don't know what has happened to him." I guess what made me think in this verse was this - Moses was gone only 40 days and 40 nights, up Mt. Sinai. Granted, the Israelites were in the middle of nowhere, so this actually might be quite a long time for him to be gone in these circumstances. But, my thought is this - Do you think maybe the Israelites had somehow gotten "bored" with God? And I ask this because I wonder if maybe we today get "bored" with God or "bored" with our faith? And if so... why? Why did the Israelites get bored? Why do we get bored? What makes me nervous about getting bored with our faith is that what we see take place later in this chapter to the Israelites can happen to us - we can pursue false Gods and indulge in dangerous sins. Typically, I find faith in God and a relationship with God to be the most adventurous thing on earth! However, I will admit that there are perhaps seasons in my walk where I somehow get bored with my faith. And I think if I honestly look back a these seasons, I think the boredom came because I stopped moving forward in my relationship with God. I let my faith kind of stagnate as a status quo. I started to get distracted by worldly things... And I got spiritually bored. And this was not good.... So - I wonder - what's our cure for boredom in our faith? What keeps our faith fresh? Part of me thinks that daily spiritual disciplines are part of the answer. Reading the Bible every day. Really praying every day. Giving thanks to God every day. How about for you? What do you do to keep your faith fresh? If you have any spiritual disciplines or habits you are willing to share with others please post up in the Comments section below! Thanks. In verses 7 & 8 we read – “Then the LORD told Moses, "Quick! Go down the mountain! The people you brought from Egypt have defiled themselves. They have already turned from the way I commanded them to live. They have made an idol shaped like a calf, and they have worshiped and sacrificed to it. They are saying, `These are your gods, O Israel, who brought you out of Egypt. '” What about us in our lives today? Are we so different from the Israelites? Do we make our own versions of “Golden Calves?” Do we have idols that we worship? Money? Career? Popularity? Relationships? Addictions? Our Intelligence? Technology? Do these idols stand in the way of our worship of God? Do these idols defile us? Do we think sometimes that these idols have “brought us out of Egypt” – instead of God? Will we give up these false idols and return to worshipping only God, Jesus and the Holy Spirit with all of our hearts, minds, soul and strength? Will you give up your Golden Calf at the feet of Jesus? Verse 30 stood out for me in this chapter as Moses interceded to God for the people of Israel after their sin - "The next day Moses said to the people, "You have committed a terrible sin, but I will return to the LORD on the mountain. Perhaps I will be able to obtain forgiveness for you."" And today, we have one more powerful than Moses who intercedes for us to God - and that is Jesus. Our High Priest. The Suffering Servant. The Lamb of God who takes away the sins of the world. Commentary on Exodus chapter 32 at bible.org is at this link, and at this link, and at this link. Commentary on Exodus chapter 33 at bible.org is at this link, and at this link. New Testament - Well, as I read today's readings, Mel Gibson's The Passion of the Christ movie continues to play in my mind... I guess it was about a year ago that this movie came out? I believe it was on Ash Wednesday 2004 that it came out - which if I recall was later in the month of February last year. In any case, I am obviously a fan of the movie... I did recently pick it up at Sam's Club for maybe $20. I haven't watched it since seeing it in the theater last year, but I think I'm going to watch it again soon. It's a Lenten season movie to be sure... One other movie about Jesus that I saw last year in the theaters was The Gospel of John. Did any one see this movie? It was a great great film I thought. It basically went through the entire Gospel of John - word for word - for about a 3 hour film. Good stuff. I may need to watch this one again soon too. 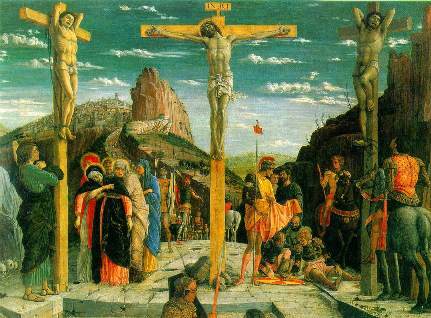 Oh - and we're coming up on the Passion play season.... anyone make a habit of seeing Passion plays? I like seeing them if I can prior to Easter. It's a powerful reminder of what Jesus did for us on the road to Calvary. Proverbs chapter 8 verse 36 is a powerful reminder of why we should seek and love God's wisdom all of our lives.... "But those who miss me have injured themselves. All who hate me love death."